Jazz up your next potluck or party you’re hosting with this simple, yet addictively delicious dip. 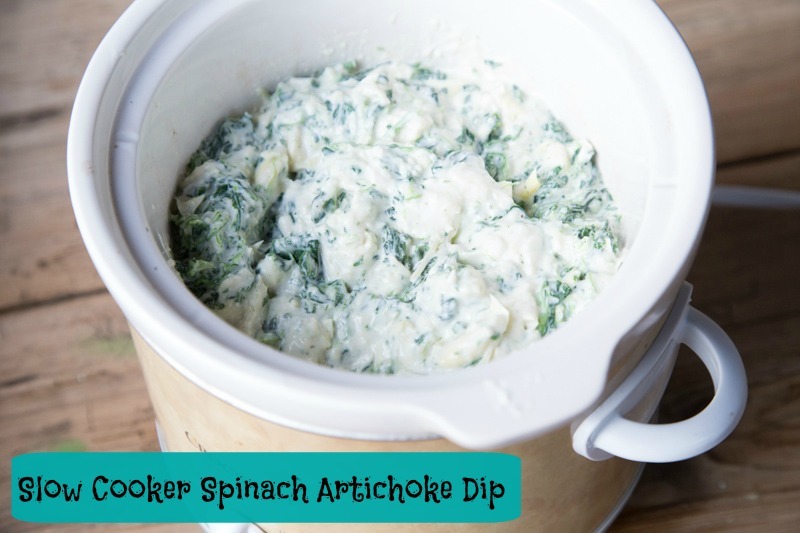 I love a good spinach artichoke dip and this recipe has just the right amount of garlic, salt and onion to go with all the creamy base and chunky artichokes and spinach. I dare you to only eat just 1 bite?!?!? If that’s possible for you, I’d love to know where you buy that self-control. Because this stuff is AMAZING and it’s impossible to only eat one bite! Also, I thought about mixing in a cup of finely chopped red bell pepper…for a touch of sweetness…but decided to keep it “pure.” But if you want to add a little red bell pepper, I think it would be a delicious mix-in! Add all the ingredients, except the dippers, to small slow cooker. Cook on low for 3 to 4 hours. If you use fresh, chopped spinach, you could cook on high for 2 hours. The frozen spinach needs at least 3 hours to warm up and incorporate into the sauce. Keep warm until serving. If desired, transfer to serving dish, or keep warm and serve from the slow cooker. Use chips, chunks of bread, pita chips, crackers or other “dippers” with this delicious dip. Enjoy!